"Dum, dum, dum, it's the sound of my gun." In America where guns are readily available with ammunition, and there have been massacres or murders carried out by minors, they have a silly saying, "Man, guns don't kill people. People kill people!" They seem to overlook the fact that people kill people with guns and without people, guns are stationary objects. In a country where police shoot and then say, "Put your hands in the air!" they just dont seem to get it that guns are lethal. In your hand bag beside your lipstick and compact, you can have an easily reached Mauser C96 or a Smith and Wesson semi automatic. Model CS4J is cute in a chunky kind of way. In Australia there are tight gun laws, storage laws and you need a licence. I was alarmed to learn that the realistic replica I had on my bedside table needed a licence and to be stored safely. I had the stance just right and if an intruder entered my bedroom I planned to leap out of bed and stand with feet apart and pistol out stretched and yell, "Get face down on the floor Bullet Bait! Move a muscle and I aim for your head." Then dial 000. I had good reason to be alert. My nighties and dresses on the clothes line had been mutilated and pegged out like animal skins. Forensics attended with camera. I was told that this is the fantasy next is your body. Having been selected as a certain victim for Jack the Ripper I moved asap. There are four clubs where you can shoot in Brisbane and you don't need a licence but you must be sane and supervised. Brisbane Gun Club offers only clay target shooting but in all three main disciplines. The thing I've found with clay shooting is that you need a large weapon like the double barrelled Beretta which is awkward and kicks back. You soon grow tired and lose interest and you've spent $60. They are located at Mt Petrie Road, Belmont. Also located at Belmont is Qld Rifle Association aka Belmont Rifle Range at 1485 Old Cleveland Road, Belmont. That is a venue where I have been happy and would reccomend. 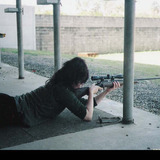 I prefer to shoot prone using a sniper's tripod. They have a cafe, a bar, accommodation and an optometrist. The City of Brisbane Pistol Club is also located on Old Cleveland Road, Belmont and caters for shift workers and the disabled. I can recommend VIP Pistol Club on Lathe Street, Virginia. You can keep your cartridges and if you've managed to shoot a good bullseyeish cluster then take your cardboard target home like I did and put it up in your entrance way. That big, red, bullseye target is eye catching and show cases your skills. Guys are either impressed or they feel inferior and emasculated. Either way as they sip their coffee, they know you are not a girl to dump and burn. You are good with a gun. It's always good to identify the men with an inferiority complex. If you're good at a lot of things then you don't need his hang ups. I've scarred enough men just by shooting at the Ekka. A gun in your hand feels great but be cautious - guns kill people.